Brandeis has six open searches for tenure-track faculty in the Division of Science this fall, with the intent to strengthen cross-disciplinary studies across the sciences. We are looking forward to a busy season of intriguing seminars from candidates this winter. Assistant Professor of Biochemistry. Biochemistry is looking for a creative scientist to establish an independent research program addressing fundamental questions of biological, biochemical, or biophysical mechanism, and who will maintain a strong interest in teaching Biochemistry. Assistant Professor of Chemistry. Chemistry seeks a creative individual at the assistant professor level for a tenure-track faculty position in physical (especially theoretical/computational) chemistry, materials chemistry, or chemical biology. Assistant Professor of Computer Science. Computer Science invites applications for a full-time, tenure-track assistant professor, beginning Fall 2018, in the broad area of Machine Learning and Data Science, including but not limited to deep learning, statistical learning, large scale and cloud-based systems for data science, biologically inspired learning systems, and applications of analytics to real-world problems. Assistant Professor in Soft Matter or Biological Physics. Physics invites applications for the position of tenure-track Assistant Professor beginning in the fall of 2018 in the interdisciplinary areas of biophysics, soft condensed matter physics and biologically inspired material science. Assistant Professor or Associate Professor in Psychology. Psychology invites applications for a tenure track appointment at the rank of Assistant or Associate Professor, with a specialization in Aging, to start August 2018. They seek an individual with an active human research program in any aspect of aging, including cognitive, social, clinical and health psychology. Tenure Track Assistant Professor in Applied Mathematics. Mathematics invites applications for a tenure-track position in applied mathematics at the rank of assistant professor beginning fall 2018. An ideal candidate will be expected to help to build an applied mathematics program within the department, and to interact with other science faculty at Brandeis. Candidates from all areas of applied mathematics will be considered. Brandeis University is an equal opportunity employer, committed to building a culturally diverse intellectual community, and strongly encourages applications from women and minorities. Diversity in its student body, staff and faculty is important to Brandeis’ primary mission of providing a quality education. The search committees are therefore particularly interested in candidates who, through their creative endeavors, teaching and/or service experiences, will increase Brandeis’ reputation for academic excellence and better prepare its students for a pluralistic society. 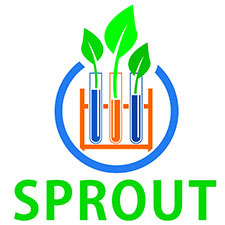 The Brandeis Virtual Incubator invites members of the Brandeis Community (faculty, staff and students) to submit an application for the SPROUT Program. These Awards are intended to stimulate entrepreneurship on campus and help researchers launch their ideas and inventions from the lab to the marketplace.The SPROUT Program will provide pilot funding for innovative scientific projects within the Division of Science that require bench research, lab space, and/or lab equipment. We will be awarding $50,000 to be shared among the most promising proposals. Come get your questions answered at one of our upcoming information sessions. Please note, the introduction of the new SPARK Program geared towards innovative non-bench projects that have impact. An additional email will be sent detailing this program. For more information on each program go to our website or contact the OTL program leaders, Melissa Blackman for SPROUT and Anu Ahuja for SPARK. PLEASE NOTE: the paper by Anthony et al. 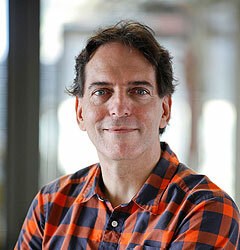 in Structure was subsequently retracted due to the discovery of research misconduct by its first author, see http://www.cell.com/structure/abstract/S0969-2126(14)00016-1. In economically turbulent times gold is acquired and held onto as a stable, secure commodity – it’s the “gold standard”. Gold of course has been a source of wealth as a precious metal and source of beauty. Importantly, gold is an incredibly dense and malleable transition metal that maintains its beauty and strength over long time periods, existing as a stable pure solid. Gold has also been an important subject of study and use in life science applications as well as in the physical sciences and in the clinical realm – not only as a source for fillings or a bridge after the dentist deals with your teeth issues! Kelsey Anthony, a doctoral student in the Brandeis Biochemistry program as well at the Quantitative Biology program, has been working with gold in the Pomeranz Krummel lab to study biopolymer structure. The properties of gold most important in these applications are that it is a pure and stable solid, forms monodisperse spheroidal aggregates, is electron dense, and has the property of anomalously scattering x-rays at specific wavelengths. All these properties combined make gold an optimal metal to be “visualized”. 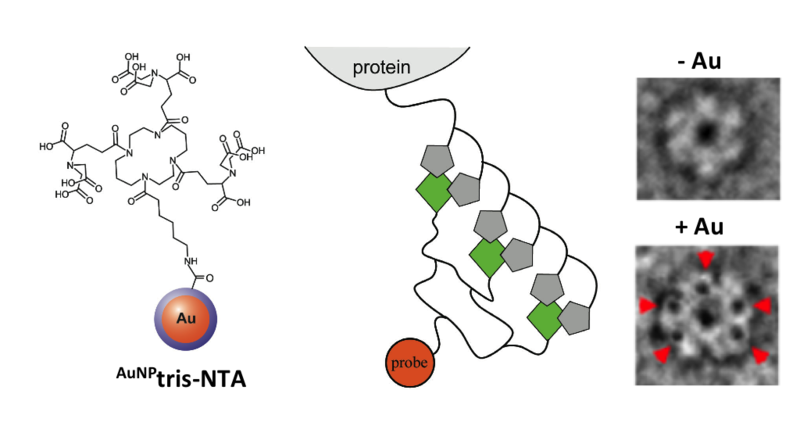 In her most recent application of gold, in press in the journal Structure, Kelsey collaborated with a group at the University of Osnabruek in Germany in the synthesis of a reagent conjugated with monodisperse gold clusters or nanoparticles (called AuNPtris-NTA, see figure) and employed this reagent to localize protein(s) of interest in large multi-protein assemblies. The experiment most visually striking to demonstrate the utility of this new “gold reagent” involved attaching it to a protein that interacts with itself to form a ring shaped structure. When visualized using the electron microscope, the gold clusters or nanoparticles site-specifically attached to the protein appear as extremely dense black spots due to their significant scattering of electrons as a consequence of the gold’s electron dense structure. In essence, Kelsey has created a stunning golden microscopic studded ring. Next up, employing this gold conjugated reagent in other new ways.